Your business is unique, so you shouldn’t have to settle for a one-size-fits-all communications solution. We’ve been making intelligent, Internet-based communications systems for seven years and everything we’ve learned is embodied in the latest versions of our StarBoxTM Cloud Connection Managers. One of them is just right for your business. We designed and built our system and services to work together and the result is a revolutionary set of features with unmatched quality and reliability. Most hosted solutions have on-premise hardware, just as Star2Star does. The difference between Star2Star’s StarBox Cloud Connection Manager and the competitors’ hardware is what’s inside. Our StarBox Cloud Connection Manager takes the place of a typical edge device, while also providing numerous additional features like built-in quality-of-service and call control. 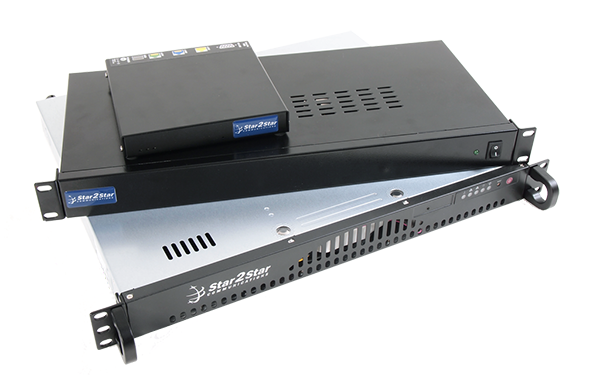 All Star2Star systems include a StarBoxTM Cloud Connection Manager, our super-reliable, solid-state, on-premise connection manager. The StarBoxTM Cloud Connection Manager connects over the Internet to one of our data centers, where we manage and monitor the quality of your phone system, around the clock. Our continuous monitoring allows us to guarantee 99.999% reliability while providing dramatic savings over traditional systems. All three are available with optional internal solid-state storage for call recording. The model 2250CR can store up to 2,500 hours of recorded calls, the 5500CR can do 5,000 hours and the StarLite CR stores up to 1,000 hours. Recorded calls can be played back using the Star2Star Application Framework and we offer an optional cloud-based archive service for long-term storage. For more information on any of the StarBoxTM models Cloud Connection Manager, click here.